The Loft, Mt. Meeker, SE Longs, Ships Prow, and Glacier Ridge. Earlier in the week I got a message from a friend I hadn't seen in awhile. Her family was out of town for the week and she was staying at the Glacier Basin Campground, and wanted some ideas for shorter outings in RMNP. Of course, I'd already spent some time thinking about what I could do. I wasn't able to get out on my normal days off, but I'd thought I could get out on Thursday before work. I suggested that we meet up dark and early at the Longs Peak TH, and go to Chasm Lake. Thus it was decided. The 2am alarm went off, and despite feeling as though I didn't ever get to full sleep, I felt somewhat chipper as I started to get ready. I was out the door shortly after 2:30, with plenty of time to make our 3:30 rendezvous. A car was behind me all the way up, and I thought they must either live somewhere up in the area or be going exactly where I was. They turned toward the trail head, just as I did. The parking lot was surprisingly full for 3:30 on a Thursday morning, yet the weather forecast was perfect for the day. I got ready and waited for a few minutes until she showed up, saying she thought she got the last legal parking space! Up we went by headlamp, occasionally seeing flashes of light through the forest of those ahead of us. We set a good conversational pace on the way up, and passed a few people on the way. It was really nice to hike with someone. It's been awhile, and I really enjoyed the company. We made it to Chasm Junction around 5:20. The headlamps came off and the sky was growing quite light. Along the Chasm Lake trail we looked back and saw the sun start to just peek over the horizon. We made it to the lake for the last few minutes of Alpenglow, and enjoyed sunrise together. It's worth getting up early once in awhile. There will only be so many sunrises in life shared with a friend. From here, we bid each other farewell, and she headed back down to make a 9am conference call. I could see that my planned ascent route looked snowy, perhaps to the point of not being ascendable at all. I briefly considered going for the Iron Gates route instead, but that would considerably lengthen the day and I had to be in Boulder by 2pm for work. I decided to just go check it out. There was indeed too much snow to ascend the standard Loft route, but I was able to stay on slabbly rock to the climbers left heading up. I found the exit ramp that cuts left just before the way up gets really steep. When you see these often wet and steeper rocks, go left! I thought the way up from here was relatively easy to follow. Look for the usual cairns and wear on the ground. At one point, a huge boulder will block the way forward. You can scramble around its left for LOTS of exposure, climb up directly on the right of it, or turn around and take the thin ramp up to avoid it completely. I had planned to maybe add Mt. Meeker on, possibly at the end of my time at altitude, but the route seemed to exit pretty close to it. A quick decision was made, and I stayed on a thin trail to get close to the summit, and then scrambled a bit to stand atop Mt. Meeker for the second time. Longs from Meeker. I could see tiny figures on top, and hear the sporadic yells of joy when the summit was reached. I wouldn't let out a cry until I was safely back on more solid ground. For reference, it took me about an hour and thirty five minutes to go from Chasm Lake to Meeker. Not bad. I've also climbed Meeker from the Horse Creek TH, and have done Meeker Ridge from the same place. I would have to say I felt the Horse Creek route to be more difficult, with more elevation gain, and much more route finding and bushwhacking below treeline. Back down to The Loft and Chasm Junction. I headed back down to The Loft and towards Southeast Longs, aka The Beaver. I made great time on the thin trail, and then found some talus on the way to the summit. Longs Peak from Southeast Longs. It took me about fifty minutes to get here from Meeker. Rappel bolt on the summit. And a crazy view back down to Chasm Lake. 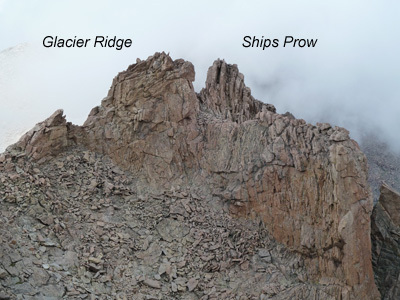 My next goals were Ships Prow Tower and Glacier Ridge. These are some interesting high points, briefly touched upon in Fosters book. Glacier Ridge is briefly mentioned on page 242, and given "all aspects are technical". Ships Prow Tower is also talked about, and referred to as technical only. However, she places them in different spots than LOJ does. Ships Prow is the rock formation that extends northeast from The Loft and looks a whole lot like a ships prow from below. As stated in this great (and confidence inspiring) trip report by JM Brooks, where is the high point? LOJ marks the summit as the NE closed contour loop at the top of the formation. 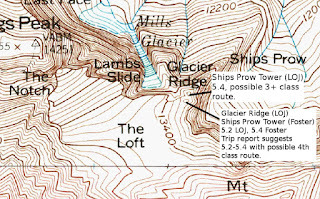 Foster chooses the SW closed loop as the summit of Ships Prow (photo page 225), without giving a specific location to Glacier Ridge. This summit is slightly higher in elevation, and called Glacier Ridge on LOJ. Glacier Ridge is given an easier technical rating on LOJ, 5.2 vs 5.4 for Ships Prow. 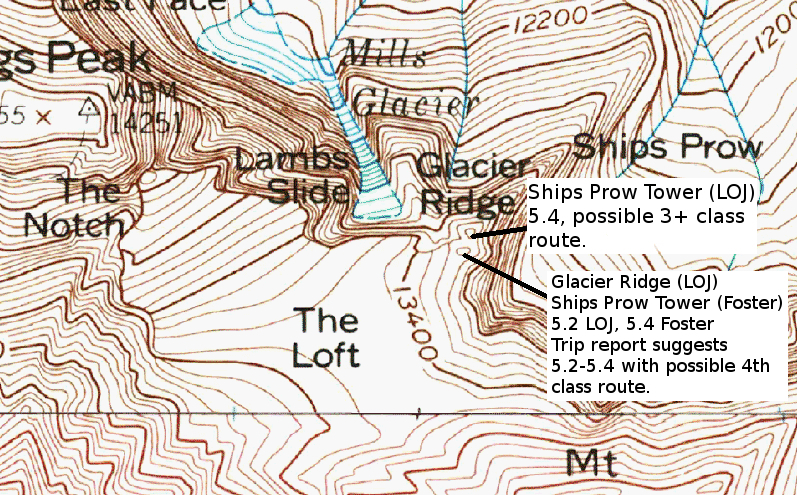 But the referenced trip report talks about a third class route up Ships Prow, and suggests Glacier Ridge could be as difficult as 5.4 with the possibility of a 4th class route. Hopefully that will help a little bit. I also neglected to take a good photo of these high points from The Loft, please click here for a photo that accompanies the trip report. For our purposes, I will use the LOJ names for the remainder of this report. As suggested by both Foster and Brooks, I skirted the SW tower on the NW to head into the gully that leads to a saddle between the two high points. I wanted to check out the third class route suggested by Brooks to be on the NE side of Ships Prow. I worked my way over blocky rock and huge exposure to arrive at a thin ridge that lead directly to the summit. I started along this, but the wind, exposure, and what looked like an easier route on the other side quickly convinced me to drop down and check it out. There were some loose blocs in this area, so use caution and make sure to test hand and foot holds before committing to full body weight. The route went, and in short order I was on top of this tiny summit. It was exposed enough that I didn't want to take my pack off and get my camera out, so I headed back down. This point has a whopping 7 registered summits on LOJ, and no register. This is the third class route from lower on. Major exposure all around. I agree with Brooks' rating of 3+ here. I crossed back over the ridge and headed back to the saddle between the high points. I would just take a look at the suggested 5.2-4 route and see what things looked like. Approaching the saddle, Glacier Ridge on the right. I made my way up toward the top, but exited right into the prominent V shape with loose looking blocs in it. I found these stable and made a few moves to work up and to the right onto some easier ground. How hard was it? Very difficult to say. It was definitely climbing, but the holds were good. I made one large step up with my right foot. I never felt like there was a chance of falling. I honestly don't know if I could tell the difference between a 5.2 and a 5.4. There was a piece of cord left as a rappel anchor around a large rock on the summit, and a Grey Poupon jar served as a register placed by Mike Garrett in 2003 and proclaiming "Ships Prow/Glacier Ridge, 13340'". That probably only adds to the confusion! The register was well intact, and I added my name, the address of this blog, and a short message to a friend now gone. The register had last been signed in 2012, and was not very populated. This point has 10 registered summits on LOJ. A unique view of Longs from Glacier Ridge. Now it was time to get down. In the name of exploration, I decided to head directly towards The Loft and see what things looked like. After all, this is the face you see from up there, and as I got closer to it, I felt it didn't look too bad, with one big step up/down move. I got to a point where I could see down. Things looked good, and I went for it. Again, how hard was it? At least 4th class, and it felt easier than the way I'd taken up, but still had definitive climbing moves. The feet were better, but the hands were worse. So 4+ to low fifth we'll say. Glacier Ridge as seen from The Loft, and the route I down climbed. I was now on less technical ground (for the time being! ), and finally let out my own excited yell. While the technical difficulties don't last for long, these points are without question two of the most exposed and difficult summits to reach in the whole of RMNP. But I still had to go back down this.... and it looks very steep from up here. I contoured around to get back to the proper place to get into the route down from The Loft. There are cairns marking it, but as always, if you were to come up this way and planning to go back down the same route, make sure to take some mental photographs of the area so you can refind the proper place to start down. Going down was no more difficult than heading up, with the route finding being pretty mellow. Until I hit the slabby rock that is. Usually I find it easier to head down things as you can generally see what route you should take from above, but here that was not the case. It took a little exploration at times, but I finally made it to the loose talus marking the bottom of the couloir. In The Loft heading down. I got back to the trail and was able to start moving a bit more quickly. Once I hit tree line I started jogging. I felt like I was making great time until a real trail runner blazed by me on the descent! Oh well, I do what I can. I got back to the car shortly after 12, giving me just over 10 hours to do this hike, and plenty of time to get to work on time. And of course, by the time I got to work on this day I'd already been awake for 12 hours, which made the day more fun! I say this about ever hike I do, but this was truly a great day. It was awesome to spend some time with a friend I haven't seen in ages, get to a few new fun and adventurous destinations, and to get to remember a fallen friend at one of those. Mount Meeker is a must do in my opinion. SE Longs is a unique point to visit, so close to the actual summit, yet so far away. Glacier Ridge and Ships Prow are pretty fun in my book, but make sure your ability level is up for the challenge. These points are amongst the most difficult in RMNP. Chasm Lake, 11780 feet: 4.2 miles one way, 2380 foot gain. Moderate+. The Loft, 13460 feet: 5.2 miles one way, 4060 foot gain. Third class. Strenuous. Mount Meeker, 13911 feet: 5.45 miles one way, 4511 foot gain. Third class. Strenuous. Southeast Longs, 14060 feet: 5.5 miles one way, 4660 foot gain. Third class. Strenuous. Chasm Meadows, 11599 feet: 4 miles one way, 2199 foot gain. Moderate+. Columbine Falls, 11440 feet: 3.9 miles one way, 2040 foot gain. Moderate+. *To explain my thoughts on these points of interest, I feel even though these are closer to the trailhead and do not have as much elevation gain as Meeker or SE Longs, these definitely have a much increased technical difficulty over either of those, and are therefore more difficult overall. Yes, The Loft route itself is third class, but it is well cairned and pretty worn in at places. Don't expect any cairns en route to the third class access to Ships Prow. 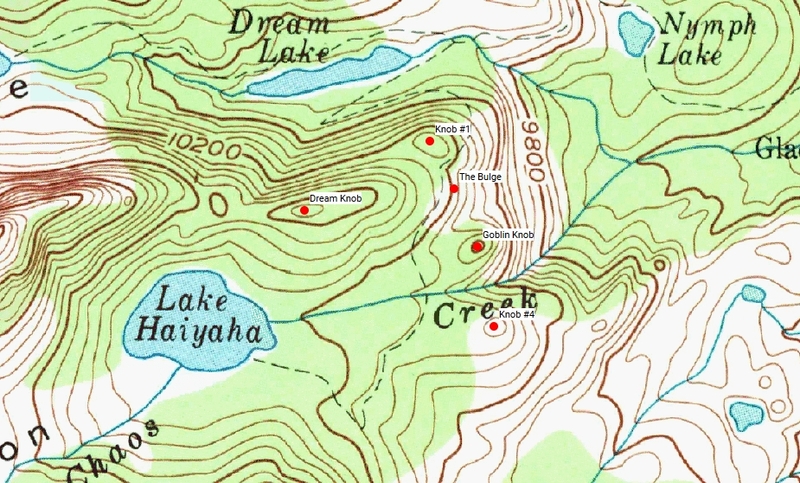 Lake Irene, Jackstraw Mountain, Timber Lake, Julian Lake, and Gray Jay Mountain. Summer is indisputably here, along with those long drives I've not been looking forward to. In reality, they haven't been that bad, though even with leaving my house at 3 am, the earliest I can hit the trail is around 5. Which of course means that when I start hitting the really big days in the fall, I won't get home until quite late in the evening. But that's ok. There was quite a bit of cloud cover as I drove up on this day. Eventually I ran into it on Trail Ridge Road, and visibility dropped to maybe 20 feet. That made for a bit of slow going. But I got through it. My first stop was at the Lake Irene TH just a little bit past Milner Pass. To add some confusion, there is also a Irene Lake in RMNP, which is located on the east side near Sprague Mountain. I was the only car in the parking lot and made the quick jog to the lake by headlamp. It was still dark and I didn't take a photo. It was a nice and peaceful start to the day, with the just lightning night sky reflected in the still water. In a few more minutes I was back at the car and on my way to the Timber Creek TH. There were a few other cars already there as I parked and got ready. The low clouds remained in the area and were playing with the peaks of the Never Summer Mountains. Quite a sight. There was a warning posted at the trail head that there had been a landslide at around 2 miles in and going around it required experience in back country travel. No big issue for me. Gray Jay Mountain as seen from the Timber Creek Trail. At 10965 feet, this is another of those ranked but unofficially named peaks in the park. I hit the landslide area and worked around it. The bypass trail here is definitely steep and somewhat loose at times. Use caution! Unfortunately on the way up I didn't stay on the well defined trail and did a little bushwhacking. At some point during this I realized I had dropped my sunglasses! ARGH! I went back down a little and looked but I had no idea if I was even on the same path I'd taken up and gave up on them. I could look on the way back. I got to Jackstraw Campsite 2 (the higher one) and took a quick break. It was pretty cool to look up and see the ridge that we'd hiked fifty one weeks ago en route to Mt. Ida. I remember looking down at Timber Lake and Julian Lake from there and how beautiful it was. I basically went through the campsite and continued uphill. There were a fair number of animal trails, and I stuck to them in places. Eventually I topped out a plateau. Jackstraw Mountain has three distinct summits, this being the southernmost. While this one held a cairn, it is not the true highpoint. Looking from the south highpoint to the true summit on the middle plateau. It was just a few minutes of easy travel between the two. Low clouds continued to play with the Never Summer Range, adding interest to the day. It was quite difficult to determine the exact highpoint of Jackstraw Mountain. I walked around a bit, could not find a cairn, and eventually decided that this little patch of trees was about as close as I would get. I headed back down via the beautiful and lush gorge between the two summits, following animal trails and a small creek in the general direction of Timber Lake. I met back up with the trail and saw the first people of the day, who'd spent the night at one of the higher campgrounds. Near Timber Lake I saw another couple, who must've camped as well. I made my way around Timber Lake on a thin trail. I love these high lakes. So peaceful and pretty. In some ways they can be more rewarding than a peak in my mind. From here I could clearly see a good route up to the saddle between Timber and Julian Lakes. There was minimal bushwhacking, the talus was pretty stable and large, and things generally felt right. Until I saw a head pop up about 20 feet uphill of me. And then a second. A female and young male moose! I made a little noise, but they generally (and thankfully) seemed totally unconcerned with my presence, and went back to eating. I traversed a few hundred feet west to give them a wide berth before continuing to head up. Remember those low clouds I talked about? I essentially climbed into one. At the top of the saddle I could not see a clear way down to Julian Lake. In fact, I couldn't see the lake at all! I waited for a few minutes and looked around. I found a way to stay on rock slightly west of the steep snowfield on the north side of the saddle. The clouds kind of opened up and I got a glimpse of the lake. The route I took down was solidly in the third class, and a little bit exposed at times. But it went, and I soon found myself in a large talus field with the lake at the end. Again, the rock was very stable, with most of the pieces being large and immobile. The movement definitely gets slower in conditions like this, and it felt like it took me a long time to get to the lake. I finally made it to the lake and sat for a snack. What a beauty! This is a very special place in the park, and the clouds certainly added to it all. I had to let it all sink in, try to memorize every line, how the trees and clouds looked. This is the rock face I made my way down. If I had been able to see, I may have made my way farther west and taken the grassy ramps down instead. After taking some time to take it all in, I started back up directly west of the lake, keeping north of the sharp ridge of rock running down from above. Near the top of this ridge I captured this view. Pretty awesome. I topped out the high point west of Julian Lake and found a small cairn there. This point does not seem to be named (at least as far as I can find) but it seems to offer a good view and is a cool little feature. May I propose the name Julian Ridge? My GPS had me at 11922, while it looks like the USGS topo has a closed loop at 11880. So we can call it 11880+ feet, or give the height as halfway between this and the next loop, which would be 11900. I could see a series of meadows working downwards to Long Meadows. If you look at a topo map, you'll see a creek heading down that starts almost directly west of Julian Ridge. The meadows essentially followed this creek. When there weren't meadows, I was able to make use of animal trails. In reality, it didn't take me too long at all to get down to Long Meadows. A single tree in the meadow. Though some maps show a distinct trail running through the meadow, I didn't cross one as I headed up to Gray Jay Mountain. This was what some of the terrain looked like on Gray Jay. Fun, fun, fun! Well, after bushwhacking down Spruce Canyon last year, and Forest Canyon the year before that, everything else has gotten easier. Which is to say those two were so bad I can't imagine anything more difficult. Here there was some dead fall to move over and around, but that was about it. I was again able to follow animal trails at times. Thankfully animals are lazy (or efficient) and don't create pointless switchbacks and generally go around any difficulties. The trails are often quite easy to follow. As I neared the summit, the terrain changed and became less treed and a little bit more open. I found the summit cairn about half an hour after leaving Long Meadows. The mosquitoes had found me by now and I was wearing my rain jacket. I had a quick snack and started down. My original plan was to head NE and pick up the trail near the Longs Meadows intersection. I didn't veer east enough and essentially climbed down the somewhat steep north face of Gray Jay. At one point I could see the landslide area through the trees and decided to veer east of that since I would have to spend a little time exploring there to look for my sunglasses. I crossed Timber Creek on a downed tree and made my way up. In what felt like a short time, I hit the Timber Creek Trail. Someone was coming down and I asked him if we were above the landslide. He confirmed that we were. I mentioned that I'd dropped sunglasses in the morning and asked him to pick them up if he found them. He said he would and leave them at the sign at the trail head. I ate some food and then headed down. I got to the landslide area and tried to retrace my footsteps from the morning. I had little luck and figured the glasses were gone forever. I was angry with myself because I didn't stow them properly, and now I needed to buy new ones. But farther down the trail I ran into the same guy who was taking a break. He'd found them! He handed them over to me. That really made my day! There was a ranger back at the trailhead. I talked to her and the two guys with her for a little bit. I ate a snack and ended up giving the guy who found my glasses a ride back to the Timber Creek Campground. Sorry I don't remember your name now, but thank you again. It took me about half an hour longer to drive home than it did to drive out. It was mostly Elk related traffic in RMNP. This was a great day in the park, and I am actually coming to like (as much as I can) bushwhacking. At least that virtually guarantees you will have a summit to yourself. Timber Lake is obviously the easiest of these destinations to get to, as the trail goes right to it. The peaks probably see a few summits a year. I'd guess Julian Lake sees maybe ten people a year at most. Like some of the other lakes that are high up, the difficulty in getting there likely keeps most people away. I did find this cool trip report from 1996 which is worth a look. Though it might not be any easier, I could see starting from Milner Pass and descending from Mt. Ida to the saddle between Timber and Julian Lakes as a possible method to get to Julian Lake. For some easier terrain, you could also stay on Julian Ridge until you end up south of Julian Lake and have a much easier hike down to the lake on grassy slopes. Link to Caltopo map of hike. All distances given are as part of the hike. Lake Irene, 10600 feet: .5 miles each way, -60 foot gain. Easy. Jackstraw Mountain, 11704 feet: 4.8 miles each way, 2644 foot gain. Second class. Moderate+. Timber Lake, 11060 feet: 6.2 miles each way, 2000 foot gain. Moderate+. Julian Lake, 11100 feet: 7.2 miles each way, 2040 foot gain. Up to third class. Strenuous. Julian Ridge, 11880+ feet: 7.5 miles each way, 2820 foot gain. Second class. Strenuous. As a whole, this hike covered approximately 13 miles with 5800 feet of elevation gain. Strenuous. *= it would obviously be somewhat shorter and easier to go directly for these from the trail head. The elevation of Long Meadows could be anywhere between 10400 at the north upper side and 10200 at the south and lower side. Occasionally I will check Listsofjohn.com (truly a great reference) to make sure I have gotten to every named peak in a certain area, just to double check. As I have said a few times in the past, while an incredible reference, Fosters book doesn't include every peak in the park. There are several ranked but unofficially named peaks that didn't make the cut, and ranked but unnamed peaks were not included either. 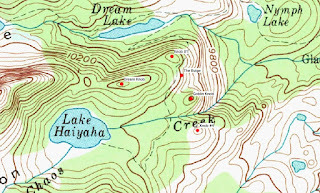 In this case, the 'knobs' around Lake Haiyaha were named in the book "Backcountry Skiing and Ski Mountaineering in Rocky Mountain National Park” by Mark Kelly, which came out in 2013, well after Fosters book was published, thus they are not in her book. The Knobs near Lake Haiyaha. Anyway, it was during one of my forays on LOJ that I noticed these high points pop up. It would be a short day to get them, and certainly violate my unoffical "the total time of the drive each way must be shorter than the time of the activity rule". When hiking, that is usually no concern! So I decided to string together a series of lakes in a loop, and run it... well, as much as I could. Thus I planned to start at Glacier Gorge, take the trail by Alberta Falls to Mills Lake, then hit the Loch, then Lake Haiyaya and the knobs, then Dream Lake, and finally Nymph Lake before taking the trail back down to Glacier Gorge. Bear or Emerald Lakes could easily be added on for (slightly) more distance. There were a few other cars in the parking lot when I arrived, but nothing like what was there when I got back. Half Mountain from the trail. Mills Lake was beautiful as always. A quick moment here and I headed back down. Longs Peak in clouds. It was only hours before that Andrew Hamilton had finished off the 14ers here, and set a new record of 9 days, 21 hours, and 51 minutes to take almost a full day off the record that had been in place for 15 years! Well done Andrew and my congrats! I turned off to The Loch and started up. Not too long after I was there. I could see some people working their way around the lake en route to higher altitudes. The trail from The Loch junction to Lake Haiyaha held some of the steepest terrain of the day, and I simply quickly hiked most of it. This marks the first time I'd been on this trail in the summer. Lake Haiyaha is pretty cool. I think this would stand out in my mind as a nice family destination because it is just hard enough, has great views, and I can imagine kids having a ton of fun exploring the boulders in the area. After the lake, I got back on the trail headed north and took off east shortly after to find Knob #4. I didn't take a photo from it, but it was just a short walk over. From that I headed down to Chaos Canyon Cascades, a series of falls that I had yet to visit. This was pretty cool. Very peaceful to be so close to a very popular trail yet feel completely isolated. Simply follow a thin trail down the south side of the creek when you cross the outlet. It's maybe five minutes from the trail. This small boulder marked the high point of Goblin Knob. It's a short third class scramble to the top. The view to points north. And a great view to Longs Peak, Thatchtop, and Knob #4 dead center. The Bulge is mere feet from the trail, but again I did not take a photo. From there I headed uphill west over some rocky and bushwhacky terrain to arrive at Dream Knob. Due to the off trail travel, this was definitely the most difficult of the high points to find. Dream Knob and twisted pines. I went back down to the trail and then made a similar approach to Knob #1, again not pictured, and again just a short jaunt off the trail. I got back on the trail and headed down. It was a different experience. I am usually used to seeing no one at all, but passed a ton of people as I headed down. I arrived to a full parking lot about three hours after I'd left. This was a fun shorter day. Chaos Canyon Cascades is certainly worth the short side trip down from the trail, and is more impressive than some of the named waterfalls in the park. Of the knobs, I'd suggest Goblin Knob and Knob #4 as being the best as both are relatively easy to get to, and both offer some pretty darn good views. Mills Lake, 9940 feet: 2.7 miles one way, 760 foot gain. Moderate. The Loch, 10180 feet: 2.9 miles one way, 1000 foot gain. Moderate. Dream Lake, 9900 feet: 1.1 miles one way, 450 foot gain. Easy+. Nymph Lake, 9700 feet: .6 miles one way, 250 foot gain. Easy. * = From Glacier Gorge TH, subtract about a mile if starting from Bear Lake TH. As a whole, this hike covered approximately 8 miles with 2000 feet of elevation gain. Moderate.